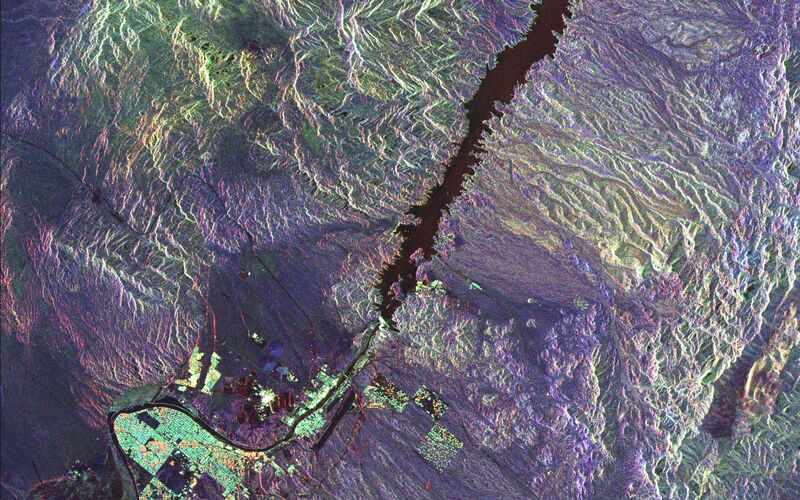 This space radar image illustrates the recent rapid urban development occurring along the lower Colorado River at the Nevada/Arizona state line. 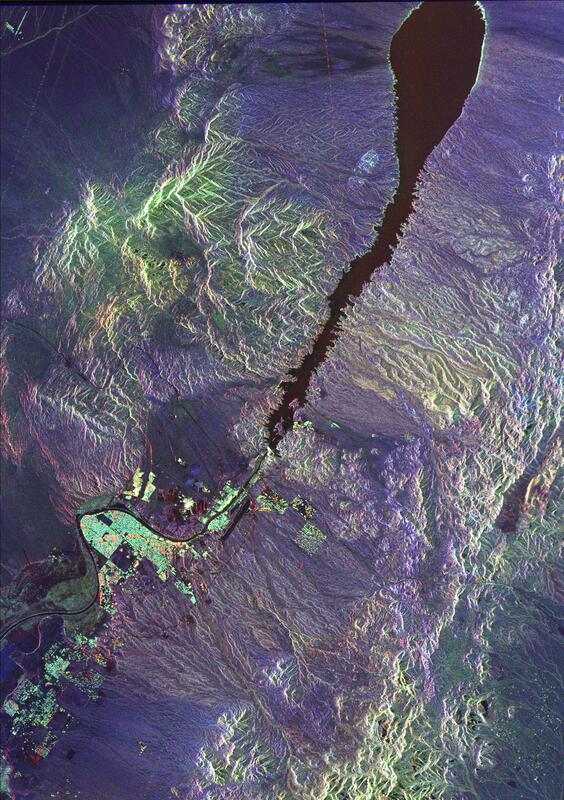 Lake Mojave is the dark feature that occupies the river valley in the upper half of the image. The lake is actually a reservoir created behind Davis Dam, the bright white line spanning the river near the center of the image. The dam, completed in 1953, is used both for generating electric power and regulating the river's flow downstream. Straddling the river south of Davis Dam, shown in white and bright green, are the cities of Laughlin, Nevada (west of the river) and Bullhead City, Arizona (east of the river). The runway of the Laughlin, Bullhead City Airport is visible as a dark strip just east of Bullhead City. The area has experienced rapid growth associated with the gambling industry in Laughlin and on the Fort Mojave Indian Reservation to the south. The community of Riviera is the bright green area in a large bend of the river in the lower left part of the image. Complex drainage patterns and canyons are the dark lines seen throughout the image. 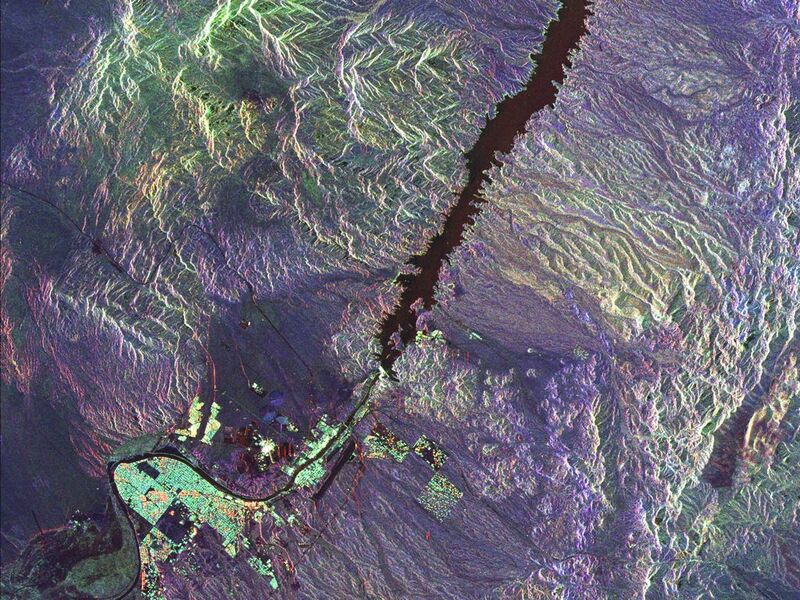 Radar is a useful tool for studying these patterns because of the instrument's sensitivity to roughness, vegetation and subtle topographic differences. This image is 50 kilometers by 35 kilometers (31 miles by 22 miles) and is centered at 35.25 degrees north latitude, 114.67 degrees west longitude. North is toward the upper right. The colors are assigned to different radar frequencies and polarizations as follows: red is L-band, horizontally transmitted and received; green is L-band, horizontally transmitted and vertically received; and blue is C-band, horizontally transmitted and vertically received. The image was acquired by the Spaceborne Imaging Radar-C/X-band Synthetic Aperture Radar (SIR-C/X-SAR) on April 13, 1994, onboard the space shuttle Endeavour. SIR-C/X-SAR, a joint mission of the German, Italian and United States space agencies, is part of NASA's Office of Mission to Planet Earth.